Colour There are 39 products. 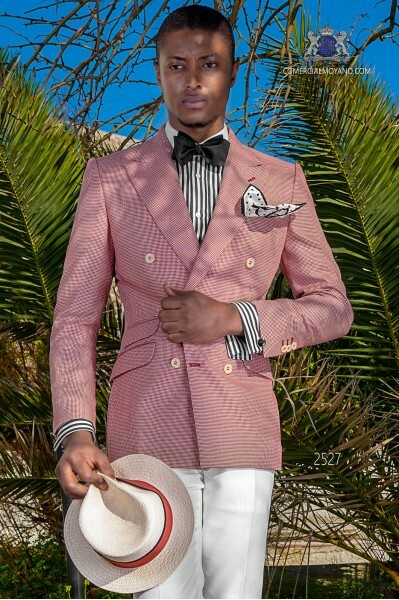 Italian bespoke red striped linen suit. Italian bespoke red striped pure linen suit with wide peak lapels, 1 corozo button, ticket pocket and double vent. 100% linen fabric. Tuxedo Wedding suit 2550 Fashion Color Collection Ottavio Nuccio Gala. Coordinated with pink linen waistcoat and trousers. Italian bespoke red houndstooth double breasted suit with wide peak lapels, 6 mother of pearl buttons and double vent. Houndstooth wool mix fabric. 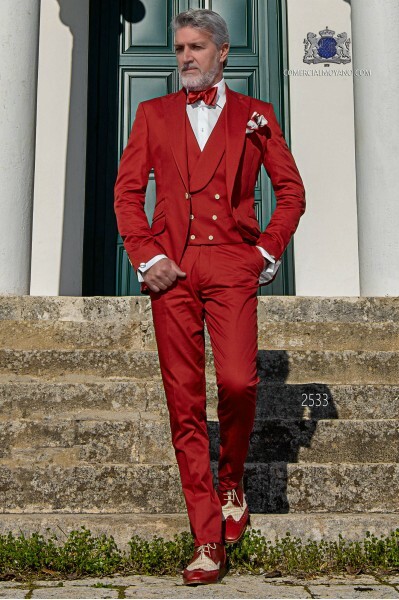 Tuxedo Wedding suit 2527 Fashion Color Collection Ottavio Nuccio Gala.Coordinated with white trousers. 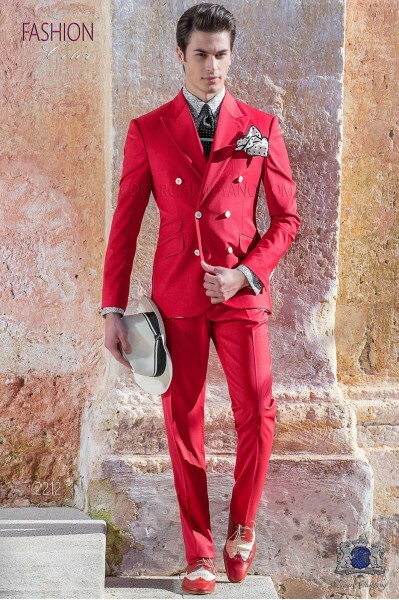 Italian bespoke red new performance double breasted suit with wide peak lapels, 6 mother of pearl buttons and double vent. 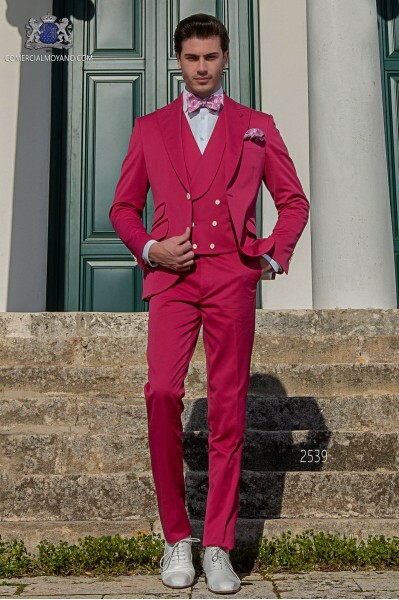 Tuxedo Wedding suit 2531 Fashion Color Collection Ottavio Nuccio Gala. 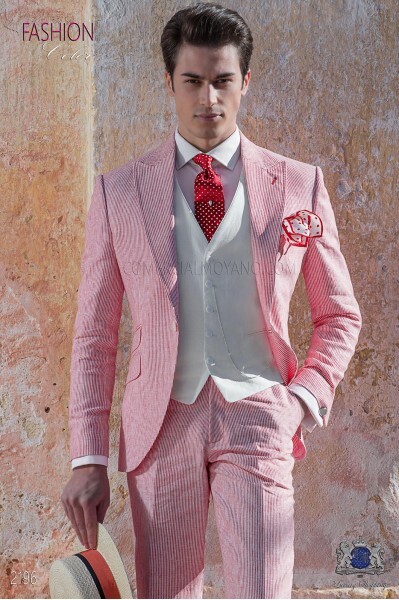 Italian bespoke light pink morning suit, with wide peak lapels and 1 button, 100% linen fabric. 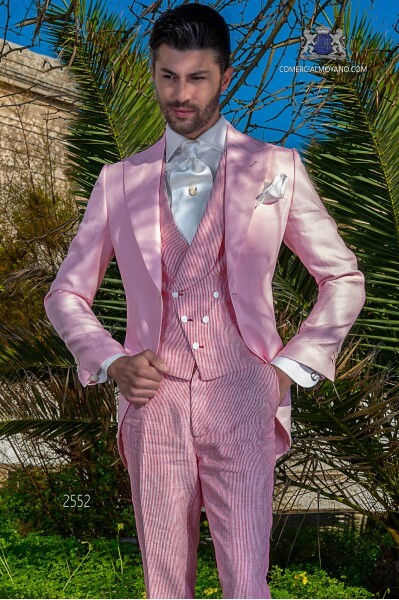 Tuxedo Wedding suit 2552 Fashion color Collection Ottavio Nuccio Gala.Coordinated with red striped crossed waistcoat flap shawl and trousers. 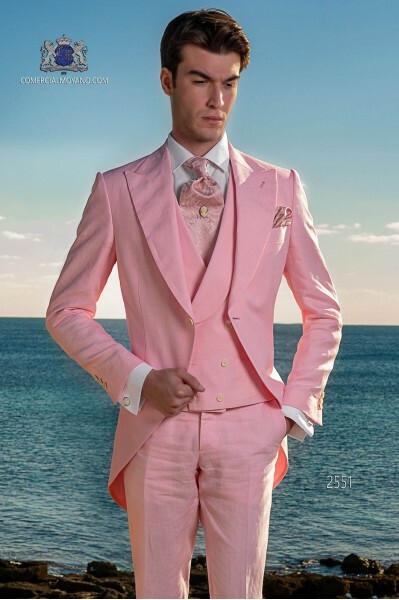 Italian bespoke light pink new performance double breasted suit with wide peak lapels, 6 mother of pearl buttons and double vent. 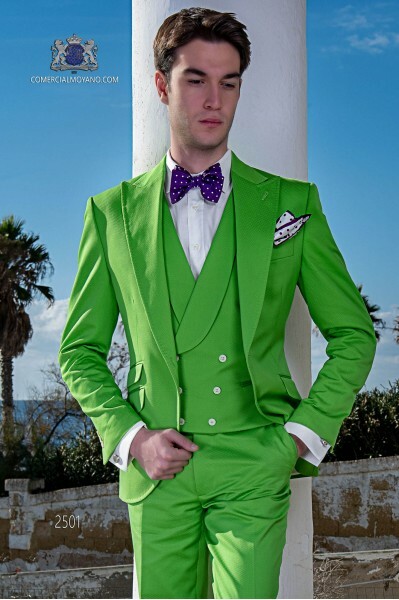 Tuxedo Wedding suit 2504 Fashion Color Collection Ottavio Nuccio Gala. 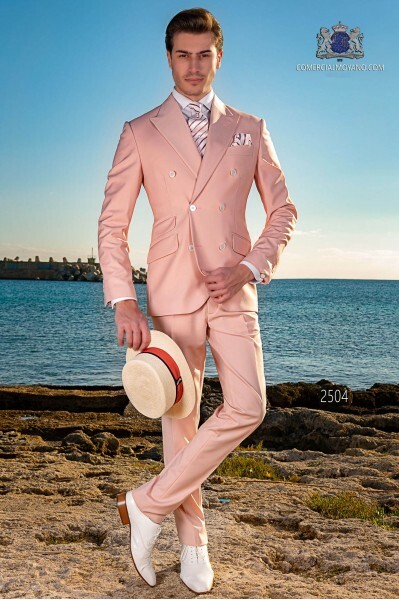 Italian bespoke light pink morning suit, with wide peak lapels and 1 button, 100% linen fabric. Tuxedo Wedding suit 2551 Fashion color Collection Ottavio Nuccio Gala.Coordinated with crossed waistcoat flap shawl of the same fabric. 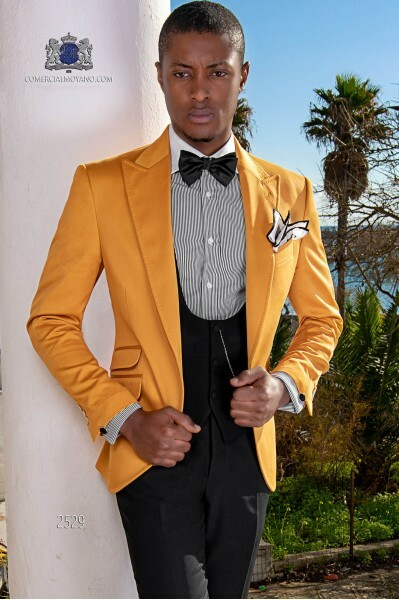 Italian stitched bespoke pure cotton satin yellow suit with wide peak lapels, 1 corozo button, ticket pocket and double vent. 100% cotton fabric. 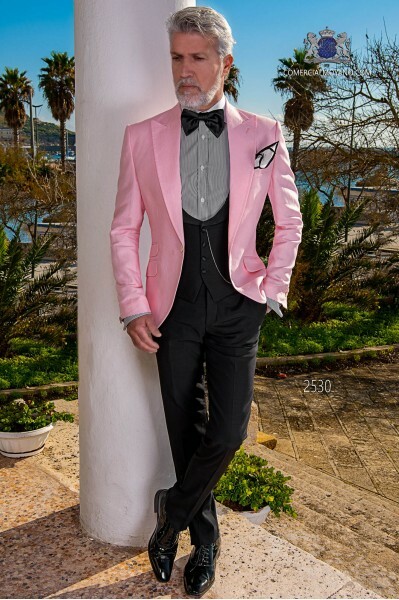 Fashion tuxedo wedding suit 2503 Fashion Color Collection Ottavio Nuccio Gala. Italian bespoke fuchsia pure cotton piqué suit with peak lapels, 1 corozo buttons, ticket pocket and double vent. Pure cotton piqué fabric. Tuxedo Wedding suit 2539 Fashion Color Collection Ottavio Nuccio Gala. 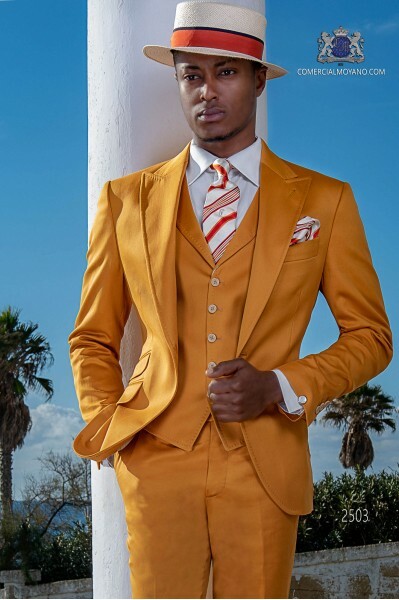 Italian stitched bespoke pure cotton satin orange suit with wide notch lapels, 1 corozo button, ticket pocket and double vent. 100% cotton fabric. 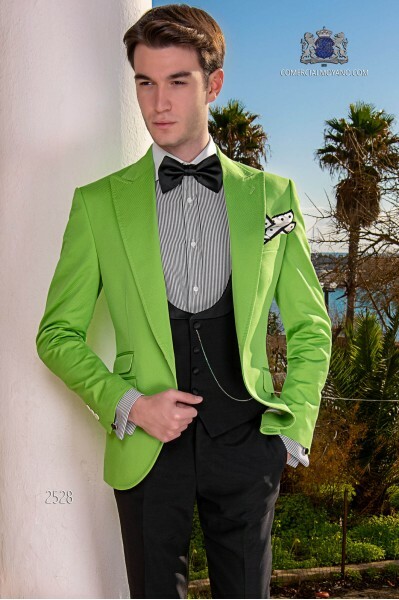 Fashion tuxedo wedding suit 2538 Fashion Color Collection Ottavio Nuccio Gala. You can complete the outfit with a matching orange cotton waistcoat with 5 buttons. Slim suit modern Italian style. Exclusive suit with pointed lapels and one button, Match Girl pocket, breast pocket and stylish tailoring with slanted pockets flaps. Red fabric 100% cotton. It comes with bag garment bag Ottavio Nuccio Gala. 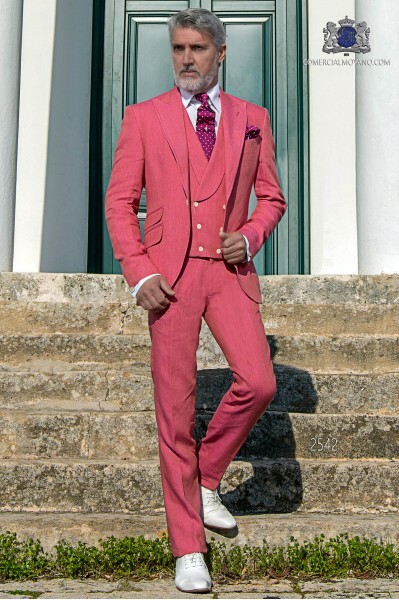 Italian bespoke fuchsia pure cotton suit with peak lapels, 1 corozo button, ticket pocket and double vent. 100% cotton microdesign fabric. Tuxedo wedding suit 2526 Fashion Color Collection Ottavio Nuccio Gala. You can complete the outfit with waistcoat and black trousers. Italian bespoke suit, red cotton jacket, fashion to peak lapel and black contrast profile, with 1 button; coordinated with black pants and vest. Tuxedo wedding suit 2524 Fashion Color Ottavio Nuccio Gala. 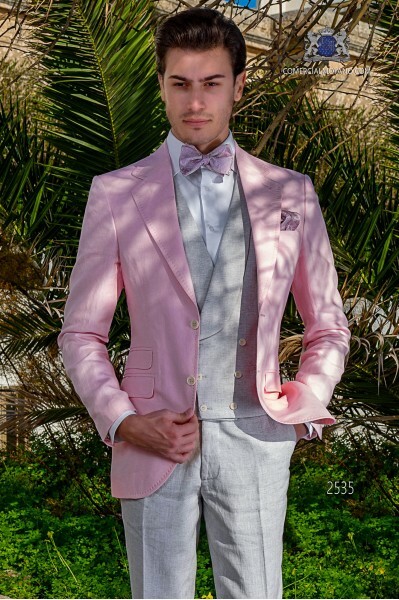 Italian bespoke pink pure linen suit with peak lapels, 1 corozo button, ticket pocket and double vent. 100% linen fabric. Tuxedo wedding suit 2530 Fashion Color Collection Ottavio Nuccio Gala. You can complete the outfit with waistcoat and black trousers. 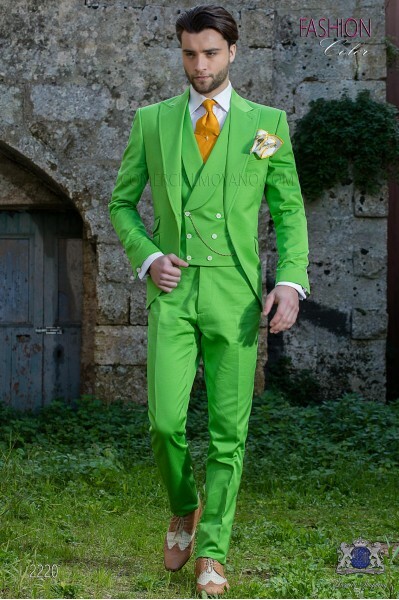 Italian bespoke green pure cotton suit with peak lapels, 1 corozo button, ticket pocket and double vent. 100% cotton microdesign fabric. Tuxedo wedding suit 2528 Fashion Color Collection Ottavio Nuccio Gala. You can complete the outfit with waistcoat and black trousers. 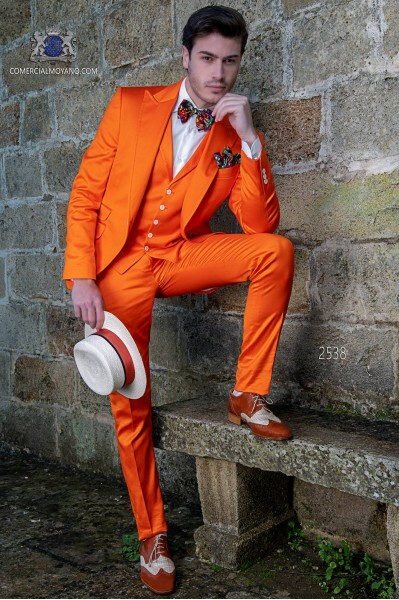 Italian bespoke orange pure cotton suit with peak lapels, 1 corozo button, ticket pocket and double vent. 100% cotton. Tuxedo wedding suit 2529 Fashion Color Collection Ottavio Nuccio Gala. You can complete the outfit with waistcoat and black trousers. 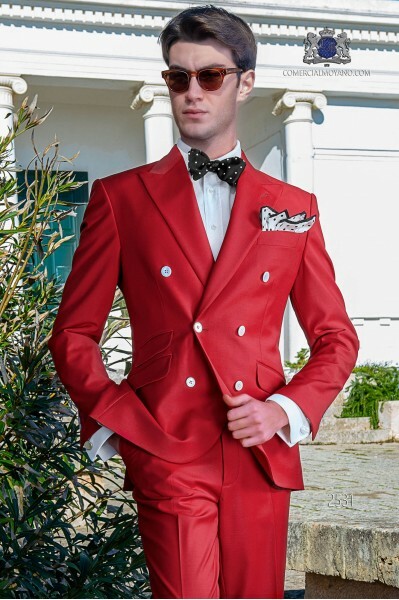 Italian bespoke red new performance double breasted suit with wide peak lapels, 6 mother of pearl buttons and double vent. 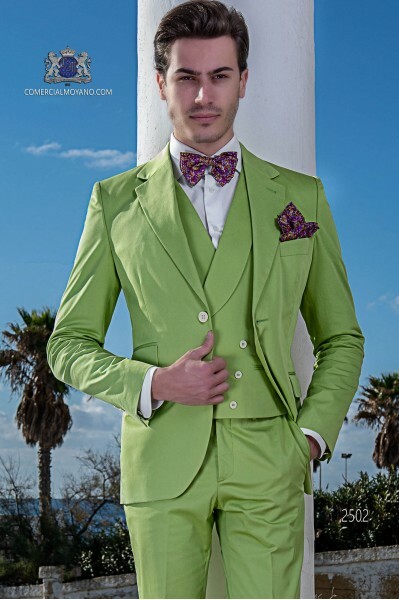 Wedding suit 2212 Fashion Color Collection Ottavio Nuccio Gala. 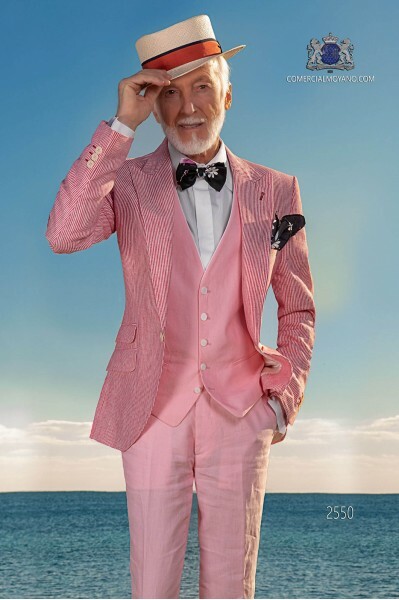 Italian stitched pink linen suit with wide notch lapels, 2 corozo buttons, ticket pocket and double vent. 100% linen fabric. Tuxedo Wedding suit 2535 Fashion Color Collection Ottavio Nuccio Gala. You can complete the outfit with a pure gray linen waistcoat and trousers. 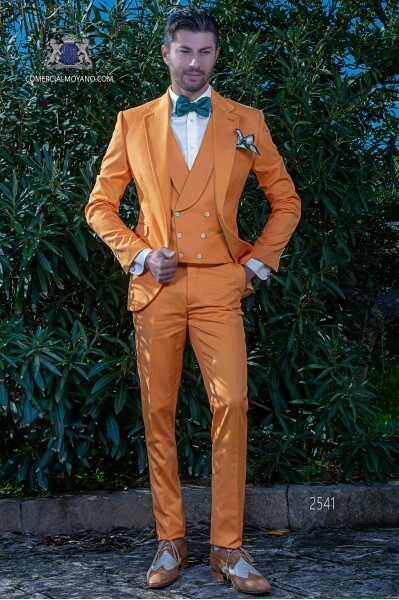 Italian bespoke orange pure cotton microdesign suit with classic lapels, 2 corozo buttons, ticket pocket and double vent. Pure cotton microdesign fabric. Tuxedo Wedding suit 2541 Fashion Color Collection Ottavio Nuccio Gala. Italian bespoke red striped pure linen suit with wide peak lapels, 2 corozo buttons, ticket pocket and double vent. 100% linen fabric. 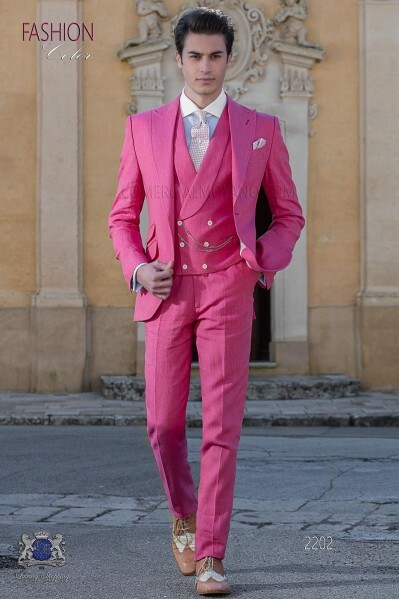 Wedding suit 2195 Fashion Color Collection Ottavio Nuccio Gala.